What are we going to do with all these cucumbers? We said to ourselves as we have an overabundance of them in our garden this year. You see, when we planted our garden, we thought, hey lets try cucumbers this year and bought a 4 pack of plants, because, let’s be honest, that’s all they had at the garden store. I had no clue how many cucumbers those 4 plants would produce. But, holy cucumber! These are good size cucumbers too. The first few we ate. Then, we made delicious cucumber salad. Then, we started giving some away to friends and family, until we had a large crop of cucumbers that we thought, hey let’s give canning a try and make our own pickles. Now, neither one of us had pickled or canned anything before, however, growing up, my mom would can stuff and my brother does it quite often now, so I reached out to them to gather some pointers as well as we went to our trusty “friend” Google, and started on our journey. We set out to gather all the necessary supplies of jars, lids, seasonings, etc. Then the next step was to make the brine of vinegar, water and your choice of seasonings. This process was pretty simple. After we heated up the brine mixture, we poured it over the jars packed with sliced and speared cucumbers. Then we seasoned them up with some fresh dill and garlic in the jars as well as pickling seasoning. We did one batch of a refrigerated method and one batch the traditional water bath method. If you are interested in further information on canning, I would recommend that you check out www.freshpreserving.com which is where we found a lot of helpful information. We let the pickles do their thing in the fridge for a week before we tasted them. They were crispy, tasty and delicious after the first week, however, the longer they sat, the better they got. We have already eaten one jar of the pickles. Now that we have completed our first canning experience, I’m sure we will tackle more in the weeks to come. Fast forward to a month later. We were just getting ready to get another huge crop of cucumbers and we were so excited to make more pickles, however, we live in Colorado where the weather can get very crazy in a blink of an eye. Last week, we experienced a hail storm that lasted for a while and this hail storm, while it didn’t damage our cars or anything, but it totally shredded our garden that was just getting ready to “pop” with all kinds of peppers. Here’s a picture of what our garden looked like right after the hail storm. It literally looked like a chopped salad with everything stripped from the branches and vines of all our plants. We are bummed! This was our third year of our little garden and we finally felt like we had this gardening thing down. We’ve been tending the soil for the past three years, weeding, feeding, etc. Oh, well…now we start to think about next years garden. Have you ever canned before? 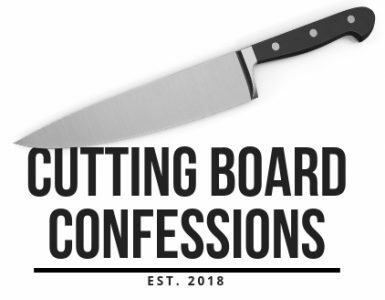 Let us know by dropping us a note in the comments section or email us at cuttingboardconfessions@gmail.com and tell us what was your favorite thing to can and why. We’d love to hear from you!